Design experts and HGTV stars, Peyton and Chris Lambton, are well known for their stunning outdoor backyard transformations on their hit show, Going Yard. But their next (and perhaps most fulfilling) project brought them inside thanks to their impending bundle of joy. They needed an organized nursery, and fast. 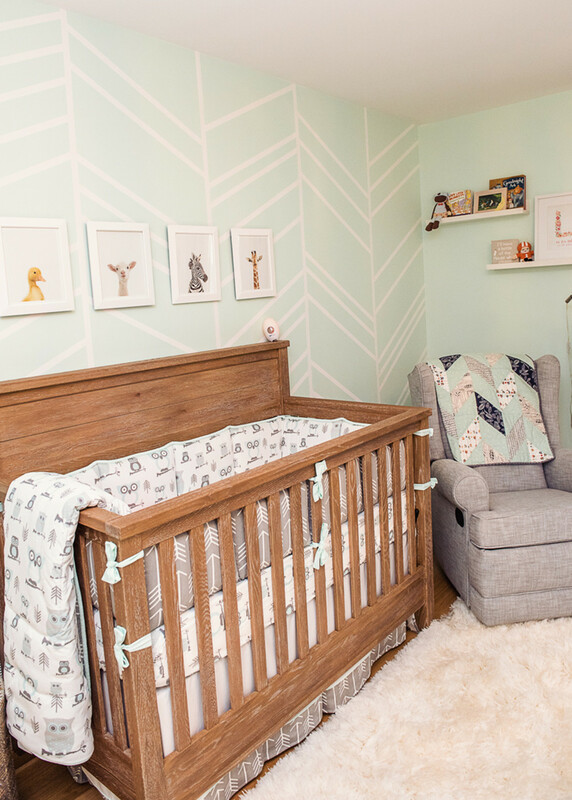 With Peyton's dream design in mind, and with our organizational expertise and elfa custom closets at hand, little Lyla's room was transformed from an empty room, into a beautiful space with room to grow. See the beautiful space, below! "There are so many things that come with a baby, so making sure we had a spot for these items was very important to me," said Peyton. elfa décor Shelves and Drawers with Mesh Baskets were installed in the space. It's a perfect system for changing needs since it can be reconfigured or added onto with just a few simple steps. Now, Peyton will never feel like Lyla's needs will outgrow her closet. Two elfa Door & Wall Racks hold everything that Peyton uses frequently and needs to grab quickly. Whether it's diapers and wipes, or swaddling cloths and pacifiers, she has it all right behind the door where it's easy to access when she and Lyla need it most. 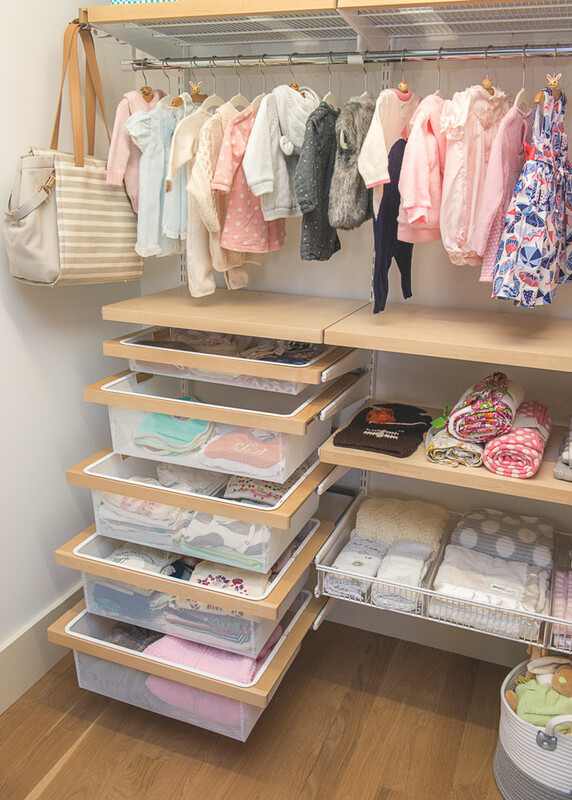 Plus, the Baskets can be repositioned in an instant to store taller or shorter items with ease. Peyton knew that every item needed a place to live when not in-use so clutter would be kept at bay. 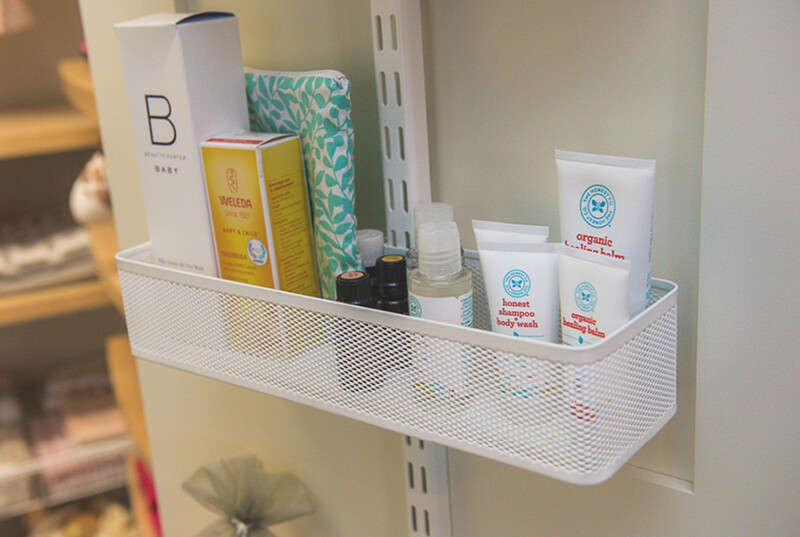 Our elfa Wire Shelf Baskets were perfect to deliver open storage that makes it easy for Peyton to grab a swaddle blanket or a burp cloth, and dividers within the Shelf Basket make it easy for everything to have a place. elfa décor Shelving provided a softer touch to the space while still letting Peyton store and display all she wanted for little Lyla. Her sizable collection of shoes are now easy to see and store! "I grew up with the elfa system in the closet at my parents' house, so I was familiar with the system. It's ideal for a space that will change over time, and that's exactly what we needed," said Payton. Now, there's ample space for all of Lyla's hanging clothes (with room to grow) and for her folded clothes with the ability to transform over time. elfa décor Mesh Baskets look sophisticated and function perfectly within the space while giving some visibility to what's stored in each one. They glide smoothly and will be easy for Lyla to access when she is older. 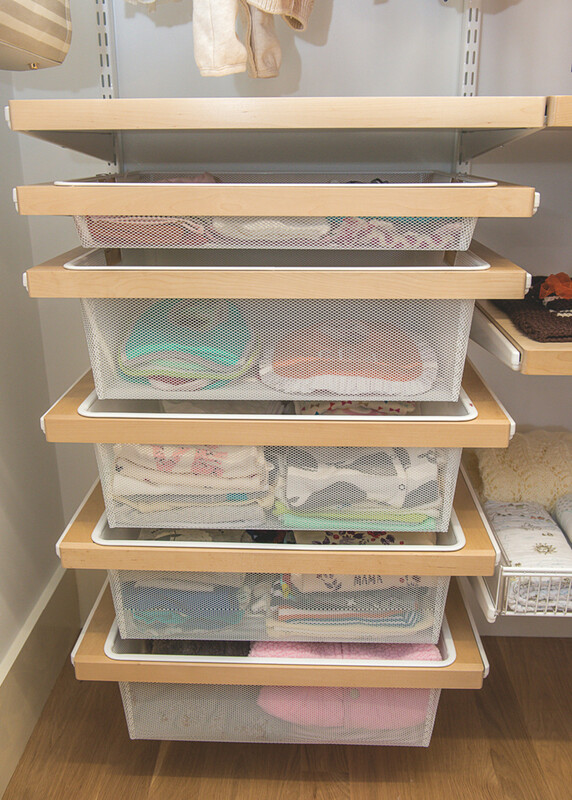 The varying depths of the Mesh Baskets allowed Peyton to store all of Lyla's folded clothes in one small space footprint. She used the middle two Baskets to store burp towels and bibs, while using the deepest Basket at the bottom to store all of Lyla's onesies and shirts. 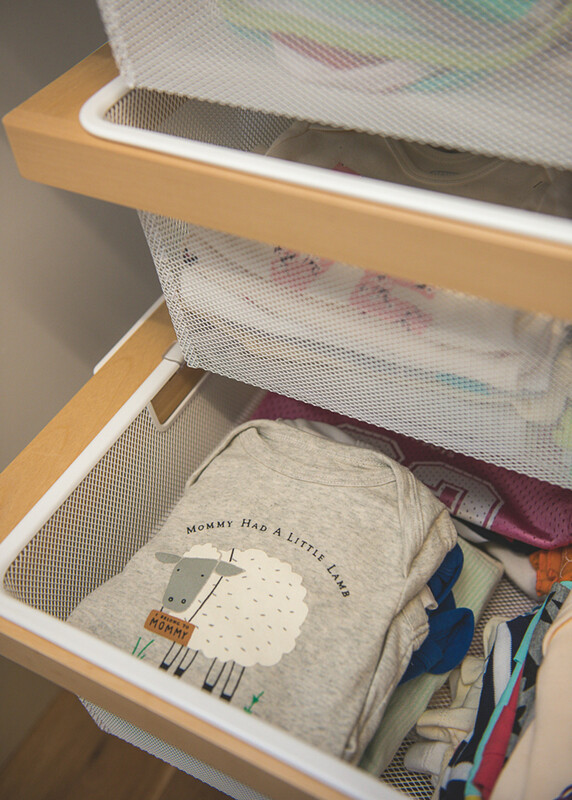 The super-sweet clothing is completely on-display yet still saves space with help from our Huggable Hangers. 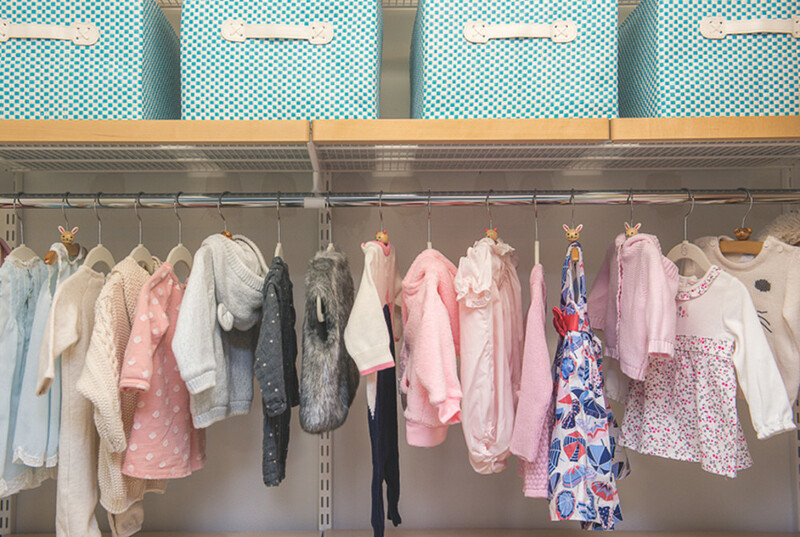 Our Infant Wooden Animal Hangers add an extra touch of cuteness to the clothes hanging in the space. Peyton stored her bulk necessities in our Gingham Storage Bins with Handles. They add a wonderful pop of color in the space and when placed on a higher shelf, conceal items without having to completely store them away. 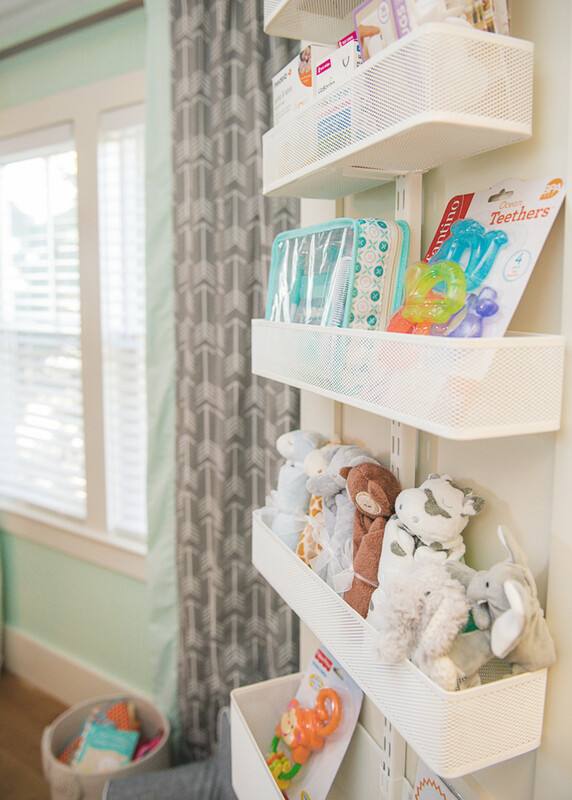 Peyton's elfa Door & Wall Rack also serves as a place to store changing necessities like baby creams, wipes and diapers. "I love the different layers within the closet. The space isn't huge, but because the ceiling is higher we could go vertical. I was shocked at just how much we could put away on the different levels. The door organization is genius and really helps with all the little items that can get lost in drawers. This makes it easy for me to find and grab these items in a hurry," said Peyton. Part rustic and part modern, Peyton and Chris made the space perfectly put together and instantly homey. A plush rug and comfortable recliner help add to the warm, cozy feeling. 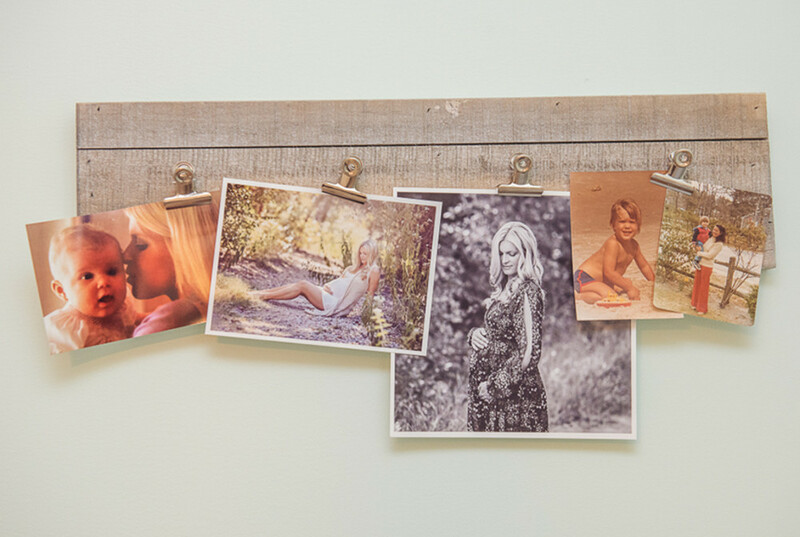 Our Mini-Bulldog Clip Magnets help hold up family photos of each parent from their childhood years. 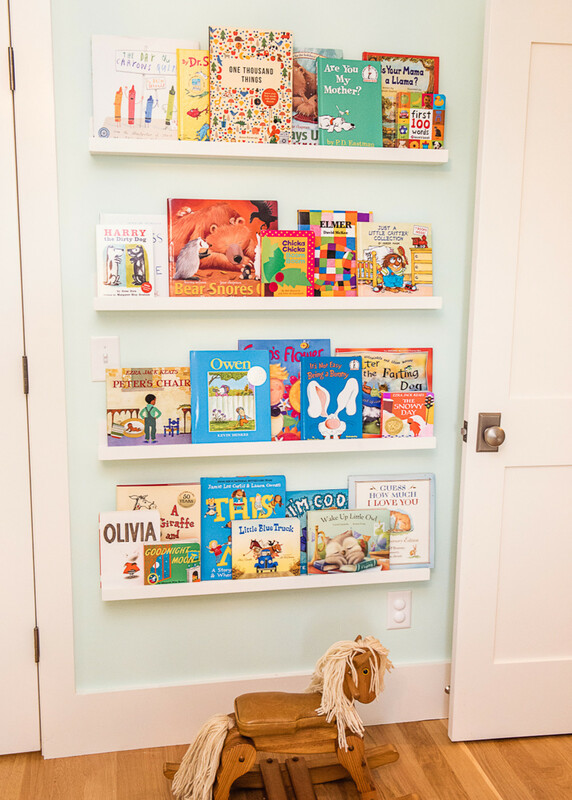 One of the sweetest area of Lyla's room has to be the reading wall stocked with children's books for Peyton and Chris to read to Lyla. The shelves with their colorful titles create an artfully arranged focal point. And like the closet, it's easily adapted to Lyla's growing interests and needs. 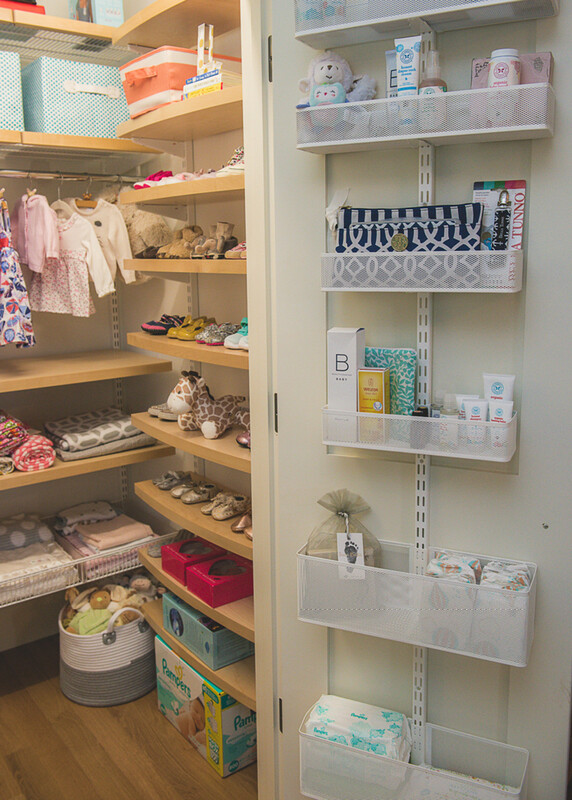 When asked what excited her the most about Lyla's new space, Petyon said, "I'm looking forward to seeing Lyla grow into this closet and hopefully she will be as organized as her mother!" We hope so too, Peyton! Congrats to you and Chris on your sweet little one!